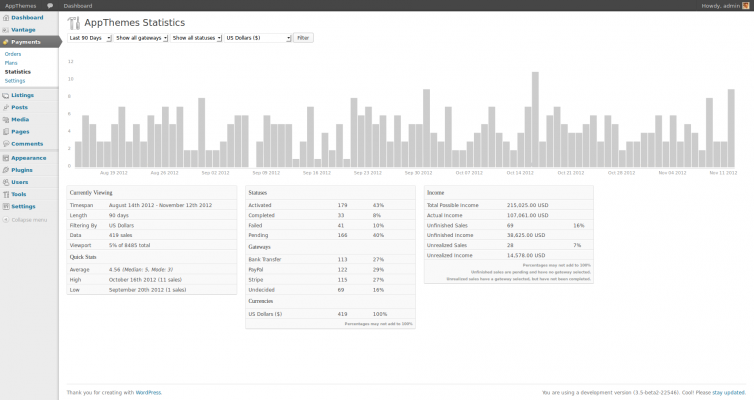 AppStats is the easiest way to get a birds eye view of what’s happening on your site. 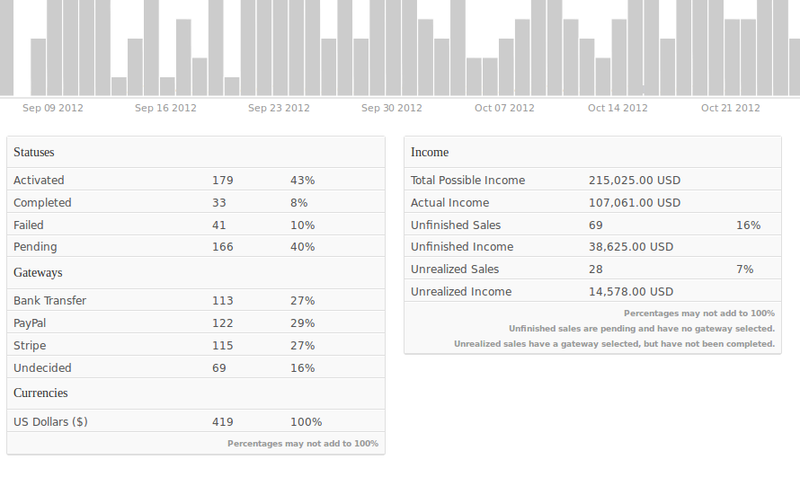 With AppStats, it is easy and simple to see all sorts of sales information. Never wonder where your income came from! AppStats knows it all. Note: We’re always looking for new ways to let you visualize your data. 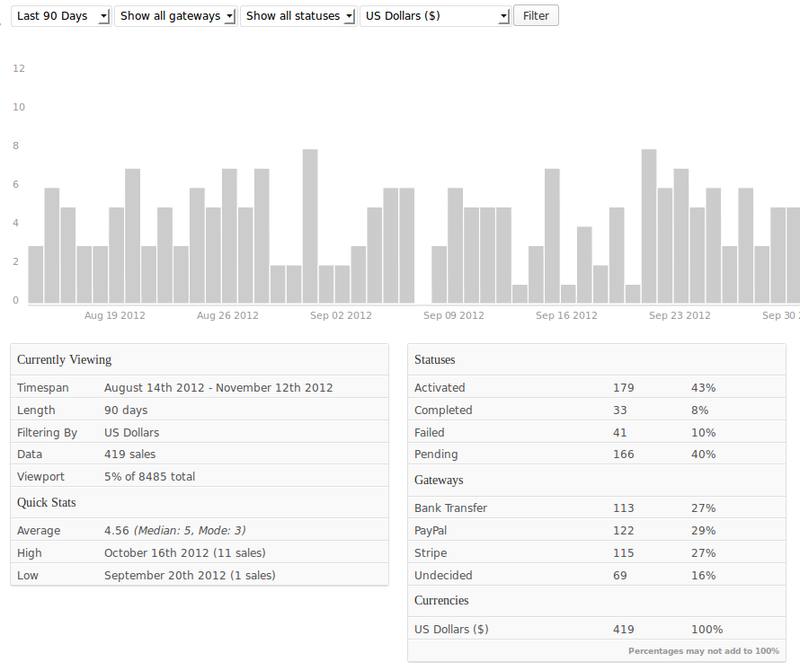 If you would like to see more statistics added to the plugin, leave a comment with your idea and we’ll put it in. AppStats will work with any theme that supports AppThemes Payments. This includes ClassiPress, Clipper, JobRoller, and Vantage. How does AppStats store statistics? AppStats doesn’t store any statistics at this time. All of the data AppStats uses is simply retrieved from the data already existing in orders. Because of this, you can activate AppStats and immediately start benefiting from it. In the future AppStats will track data that isn’t usually available. Where are the page view counts? AppStats is not a replacement for products like Google Analytics. AppStats focuses on providing analysis of data that Google can’t access, like your order data. In the future AppStats will also provide analytic data of Users, Posts, Comments and more. Why does it require PHP 5.3? Dates and times are complicated and annoying things. Some months have 30 days, some have 29. Some years have 365 days, some 366. Its a lot to deal with. PHP 5.3 introduced a DateTime library that makes it simple to deal with dates and times. This library lets us focus less on a intricacies of the calendar, and more on providing you with an awesome product. Once activated, you can access the statistics through the Payments menu. Fatal PHP error caused by using undeclared class properties. It is a good product, damage it missing the translation, I had to do the translation myself by modifying utis.php and orders-graph-list.php files and add color in style.css. Message to the author : A similar product for ad statistics will be perfect. Thanks for the feedback. As of version 1.2.0, all text strings are setup for translation and the .pot file is included. Very good plugin of a brilliant idea. Data Analytics is a must for every successful website. Even more of a necessity I think that would be pertinent to every single customer right now is data analytics pertaining to traffic, site navigation etc. Not sure why this plugin took precedence, but the person to provide these functions is going to be a winner. And we want it now!! The question is when the version for classipress 3.2+ will be available? @parfum, the plugin requires “Payments” which is planned for the next major release of ClassiPress as indicated on our theme release status page. Thanks. Bought and unable to use. PHP version issue. @razil, If you could please start a thread here in the relevant section of the support forums, our team will be more than happy to assist further with this. Thanks. Will this work on Clipper/Discounty Theme? @far33z, yes this will now work with Clipper which had AppThemes payments implemented in version 1.4. Thanks. An additional tip… the plugin can’t be activated on my multi-site installation. it’s on sub-domains (ej. http://subdomain.domain.com). Thanks for reporting! This has been fixed. Version of plugin mismatched information that API sent to Updater plugin. Hi there, I’ve been using the appstats plugin for the past few months but I am not seeing any income information showing up. I am using Paypal and Stripe and the quantities show up but no revenue / sales. Please help! @sal, I just wanted to update these comments, I see you’re already using the forums (where all support is provided) but couldn’t locate the thread specifically for what you mention here. If you didn’t find the AppStats support forum and still need help, you can post here and our team will be happy to assist. Thanks. does this plugin support Taskerr? @tammamkoujan, yes it does, as Taskerr includes “Payments”. Thanks. I just downloaded version v1.2.0, it is very well.